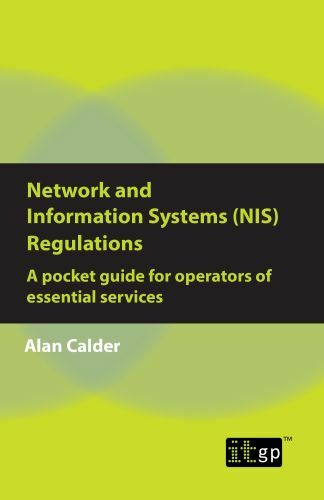 This pocket guide is a primer for any OES (operators of essential services) that needs to comply with the NIS Regulations, and explores who they are, and why the NIS Regulations are different for them. An introduction to the new NIS Regulations 2018 that bring the EU’s NIS Directive and Implementing Regulation into UK law. This guide outlines the requirements for operators of essential services based on the Cyber Assessment Framework established by the National Cyber Security Centre (NCSC), including an explanation of the objectives, principles and indicators of good practice, and offers implementation guidance. Your essential guide to understanding the NIS Regulations – buy this book today and get the help and guidance you need. Alan Calder is an acknowledged international cyber security guru and a leading author on information security and IT governance issues. Alan co-wrote (with Steve Watkins) the definitive compliance guide, IT Governance: An International Guide to Data Security and ISO27001/ISO27002 (now in its sixth edition), which is the basis for the UK Open University’s postgraduate course on information security. This work draws on his experience leading the world’s first successful implementation of BS 7799 (now ISO 27001). Alan has been involved in the development of a wide range of information security management training courses that have been accredited by the International Board for IT Governance Qualifications (IBITGQ). Alan has consulted for clients in the UK and abroad, and is a regular media commentator and speaker.